Met with an accident, what you should do? 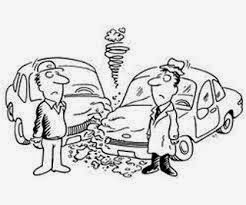 Auto accident is the last thing that you would want, on a busy morning. The only places I have mentioned about accident is when I called to get a quote for auto insurance. I usually get cheaper quotes from 21st century free quote, give it a try and see. Today morning as I was driving from home to work , I was waiting to make a right on a stop sign , the person behind me thought that I already turned right and rear ended me. Though I was not injured the impact kind of created a shock in me. We both pulled over ,but I had no idea on what I should do next. I called my husband and he told me to collect some details, I collected some of them. I just thought to myself, it would have been better if I was more prepared for this unpredictable event. Since I was not injured we didn’t call 911. I took a photo of the other persons insurance and one good thing was we exchanged phone numbers. I did not even notice what car hit mine and my mind was blank. So to all of you these are the things you need to do if an unfortunate auto accident happens . *Once you meet with an accident pull over somewhere safe. *If anyone is injured please call 911 for medical assistance. *If your car is totaled please call your road side assistance for help. *Name , phone number and email of both the party and also witnesses. *Photos of the accident scene and all vehicles involved. *Vehicle registration numbers of vehicles involved. *If 911 was called then the police report, officer name and badge number needs to be collected. After this you need to report your claim to the insurance company ,the next steps I am yet to go through. If you have had prior experience do leave a comment. If you find these posts informative, please do like my face book page IndoUSmoms page. Thank you for supporting me continue my passion. Attention to all parents whose kids have a PIO card! !